Want to help? Learn more about how you can take action today. Three public meetings in New Britain and Hamden this week turned out over 500 concerned citizens to voice their opposition to proposed standards for trimming trees around utility lines. 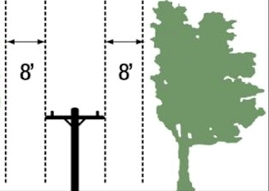 Proposed by Connecticut Light & Power (CL&P) and United Illuminating (UI), the new standards would allow for a clear-cut of any trees or branches within an eight-foot zone on either side of utility wires. The proposal does not promise to plant replacement trees or even to remove stumps. You can learn more about the importance of street trees to our health, environment, and neighborhoods here. Over 60 people spoke out at the public meetings, which lasted into the night. Some questioned the balance and fairness of the proposed plan, while others wondered if the notification and appeals process would give the property owner a fair chance to see the notice, gather more information, and offer an appeal if they wished. Scientific and financial concerns were at the forefront, with speakers from the Connecticut Department of Energy and Environmental Protection and the Yale Urban Resource Initiative questioning whether the proposed plan uses the best tree cutting practices and emphasizing the economic value of street trees—determined to be $4 million annually in New Haven alone. Rather than adopt the new standards, the Public Utility Regulatory Authority (PURA) should instead require CL&P and UI to follow the prudent recommendations of the State Vegetation Management Task Force, as CFE testified this week. These recommendations include that trees be removed based only on their risk to utility lines, not their location. CFE has been pleased with PURA’s willingness to consider public comments in their decision. We expect a second draft decision in the coming weeks, so there’s still time for your opinion to be heard! Please send written comments to PURA as soon as possible, referencing Docket No. 12-01-10. They can be emailed to PURA.executivesecretary@ct.gov and Nicholas.Neelay@ct.gov or mailed to PURA, 10 Franklin Square, New Britain, CT 06051. Please send us a copy too at lmcmillan@ctenvironment.org. Thank you!